Some time ago, I made a background page in my large journal with a wash of pink. 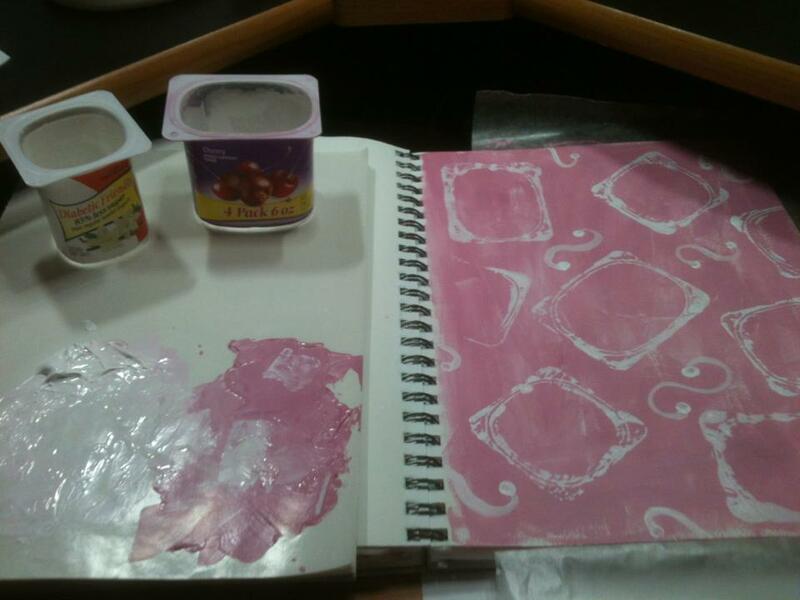 I then used two types and sizes of yogurt cups to stamp with white acrylic. I finished it off with a liner brush to add swirls in white. Today, I wanted to make a page and flipped to that stamped page that was waiting so patiently to be played with ... and so I did. Taking black markers, black acrylic and black inkpads, I used stamps and stencils and freehand chain doodling to add to it. I like this colour scheme of white, black and pink ... it just makes me think of the 50's for some reason and that was a good era! Perhaps I should have put a poodle on it! Who would have ever thought of a yogurt container!! Well YOU obviously!! It made a perfect stamp!!! I can see using it on the Gelli Plate or just using it as a stamp by just dipping it in paint. Love the swirls you added between them, they are the perfect!